In a bid to get people to vote for the African National Congress (ANC), Mzansi's president Cyril Ramaphosa made the rounds to campaign. This time with a twist, he hopped onto a Metrorail train from Soshanguve to Pretoria for the party's campaign. Much to no-ones' surprise the train was overcrowded and about an hour late. But those who caught him in the carriage were eager to snap a pic and head over to social media. People have mentioned these complaints of Metrorail being one of the most poorly operated transport systems in Mzansi, only to have nothing really change about the commute operations. So, to have the president experience what many South Africans face on a daily basis is a good eye opener. However, like most discussions that take place over the internet- some aren't impressed with the president. As they believe its in nobody's best interest for this publicity stunt except the ANC's. 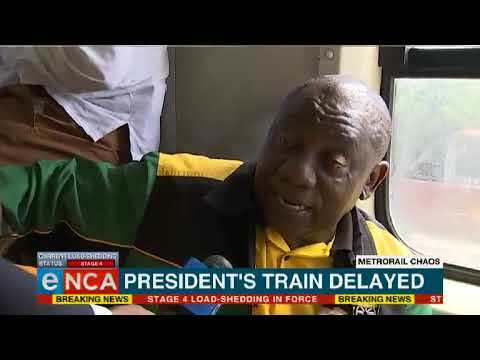 The happy ending here is, despite the train being overcrowded with no security making the rounds and the train being over an hour late-the president arrived safely in Pretoria...eventually.